Talukder Mobile Gallary (SIS) Shop # 04, 3rd floor, Razlaxmi complex, Uttara. Talukder Mobile Link-Sujon Shop#30, 3rd floor, Rajlaxmi Complex, Uttara. Transcom Digital, Gulshan Circle (DGC) 11 Rahima Bhaban, Gulshan - 2, Dhaka-1212. Transcom Digital, Gulshan Tower (DGT) Gulshan Tower, Road # 53, Gulshan - 2, Dhaka-1212. X-Telecom, B.City Shop # C1-C2 & C12-C13, Level-1, Bashundhara City, Panthapath, Dhaka-1215. X-Telecom, Chittagong - Kazir Dewri Holding No. # 05, Shop No. # 06, Ground Floor, Appolo Shopping Centre, Kazir Deuri Circle, Thana-Katowali, Chittagong. X-Telecom, Finley Tower Shop # 408-409, 2 No Gate Nasirabad, Chittagong. X-Telecom, Gulshan Avenue (Opposite of Pink City Shopping Complex), 121/d, Gulshan Avenue, Gulshan-2, Dhaka-1212. X-Telecom, Pallabi Plot # 40 ,Block # B,Road # 3 . Begum Rokeya AvenueSec # 12, Mirpur, Dhaka-1216. New Naima Telecom Aktaruzaman Center, Ground Floor Agrabad, Chittagong. Deens Mobiles, Sanmar Deens Mobiles ( Samsung Shop ), Shop NO : 463 ( 4th Floor ), Sanmar City, CDA Avenue, Chittagong. Deens Mobiles Sanmer, Tab & Camera Deens Mobiles ( Samsung Shop ), Shop NO : 464 ( 4th Floor ), Sanmar City, CDA Avenue, Chittagong. Deens Mobile, Bitul View (GF) Deens Mobiles ( Samsung Shop ), shop No-102/A,Ground Floor,Baitul View Market, Purana Pultan, Dhaka. Deens Mobile, Bitul View Deens Mobiles ( Samsung Shop ), shop No-205, Leve-2,Baitul View Market, Purana Pultan, Dhaka. Deens Mobiles Plaza Ar Deens Mobiles ( Samsung Shop ), Ground Floor, Plaza AR, House No-2, Road No-14, Beside Sobhanbag Mosque, Dhanmondi, Dhaka-1209. Mobile point Shop- 101, Ground Floor, Baitul View Tower, 56/1, Purana Paltan, Dhaka. FCL-Banashree FCL Bonosree, House# 36, Road# 2, Block# C, Bonosree, Rampura, Dhaka-1219. Deens Mobiles Feni Deens Mobiles ( Samsung Shop ), Grand Haque Tower, Holding No-547, Shop No, 71,72, Mizan Road, Feni. FCL-Pallabi FCL PALLABI, 39/40, Pallabi Shopping Center, Mirpur, Dhaka-1216. Mobile Hut-2 Shop No:301, Second Floor, 231/6, Hasnat Squire, B.B road, Chasara , Narayanganj. The exchange price range and eligible device lists is listed below. Customers should have valid proof of being the owner of the phone. Phones should not be broken or damaged or with existing internal issue. Phone should not be repaired. Customer can exchange a phone with such valuation which cannot be higher than the phone purchased. Customer should provide NID/Passport copy and follow instruction to provide all details in purchase form. 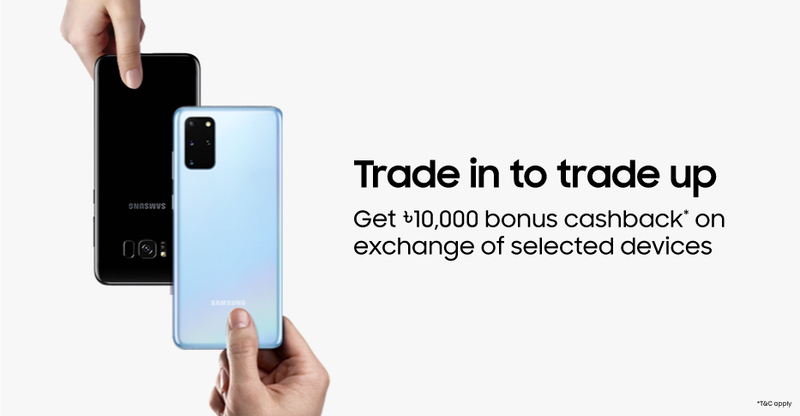 The above offers are being provided by Samsung authorized distributors at their sole discretion and under no circumstances shall Samsung and/or its affiliates, directors, employees, officers or agents be held liable for any part of these offers.